Winnie the witch has a knack for causing chaos. But now she’s taking charge! 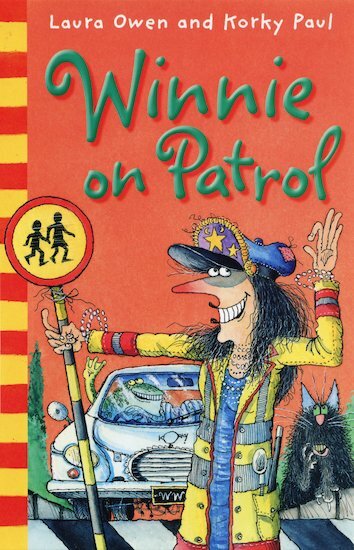 Whether she’s on patrol as a lollipop lady or taking part in a fun run, what on earth could possibly go wrong? Well… Winnie soon finds out when she sets off in the local charity race, only to find that her trainers seem to have a mind of their own! And things only get worse when she tries to rearrange some bossy magical furniture, baffles a social scientist who has decided to examine her in a study, and gives the kids at the local school a totally loopy experience when she takes a job as a lollipop lady – and makes a real zebra cross the road! Four more crazily funny stories of Winnie and Wilbur, packed with Korky Paul’s dynamic line illustrations. Pure magic for developing readers! Contents: Winnie’s Fun Run, Winnie Gets Things Moving, Which is Witch? and Winnie on Patrol.